You can also write for more information to Brad Penka, Sternberg Museum of Natural History, 3000 Sternberg Drive, Hays, Kansas 67601-2006. Ifrim, C., Buchy, M.-C., Smith, K.T., and Giersch, S. 2008. Paleoenvironment and preliminary description of early Turonian (Late Cretaceous) aquatic squamates from Vallecillo, north-eastern Mexico. Proceedings of the Second Mosasaur Meeting, Fort Hays Studies Special Issue 3, Fort Hays State University, Hays, Kansas, pp. 47-62. Irwin, K.J. 2008. 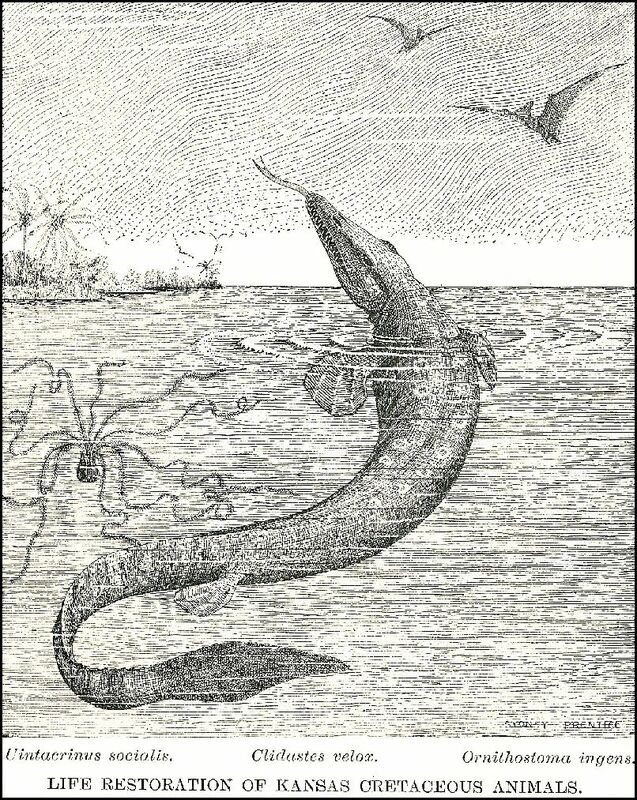 Mosasaurs of the Marlbrook Marl Formation (Late Campanian): with a historical review of the Late Cretaceous marine reptile paleontology of Arkansas. Proceedings of the Second Mosasaur Meeting, Fort Hays Studies Special Issue 3, Fort Hays State University, Hays, Kansas, pp. 63-72. Jagt, J.W.M., Cornelissen, D., Mulder, E.W.A., Schulp, A.S., Severijns, J. and Verding, L. 2008. The youngest in situ record to date of Mosasaurus hoffmanni (Squamata, Mosasauridae) from the Maastrichtian Type Area, The Netherlands. Proceedings of the Second Mosasaur Meeting, Fort Hays Studies Special Issue 3, Fort Hays State University, Hays, Kansas, pp. 73-80. Houssaye, A. 2008. A preliminary report on the evolution of the vertebral microanatomy within mosasauroids (Reptilia, Squamata). Proceedings of the Second Mosasaur Meeting, Fort Hays Studies Special Issue 3, Fort Hays State University, Hays, Kansas, pp. 81-90. Rothschild, B.M. 2008. Vertebral pathology in mosasaurs. Proceedings of the Second Mosasaur Meeting, Fort Hays Studies Special Issue 3, Fort Hays State University, Hays, Kansas, pp. 91-94. Konishi, T. 2008. A new specimen of Selmasaurus sp., cf. S. russelli (Mosasauridae: Plioplatecarpini) from Greene County, western Alabama, USA . Proceedings of the Second Mosasaur Meeting, Fort Hays Studies Special Issue 3, Fort Hays State University, Hays, Kansas, pp. 95-105. Konishi, T. 2008. Southernmost occurrence of Platecarpus planifrons (Squamata, Mosasauridae) from the Tombigbee Sand Member (Middle Santonian) of Alabama, USA, and a revised biostratigraphy of the genus. Proceedings of the Second Mosasaur Meeting, Fort Hays Studies Special Issue 3, Fort Hays State University, Hays, Kansas, pp. 106-114. Mueller, B.D., Chatterjee, S., Cornell, W., Watkins, D., and Gurtler, G.L. 2008. First mosasaur (Reptilia: Squamata) remains from the Llano Estacado of northwest Texas. Proceedings of the Second Mosasaur Meeting, Fort Hays Studies Special Issue 3, Fort Hays State University, Hays, Kansas, pp. 115-122. Robbins, J.A., Ferguson, K.M., Polcyn, M.J., and Jacobs, L.L. 2008. Application of stable carbon isotope analysis to mosasaur ecology. Proceedings of the Second Mosasaur Meeting, Fort Hays Studies Special Issue 3, Fort Hays State University, Hays, Kansas, pp. 123-130. Scanlon, J.D., and Hocknull, S.A. 2008. A dolichosaurid lizard from the latest Albian (mid-Cretaceous) Winton Formation, Queensland, Australia. Proceedings of the Second Mosasaur Meeting, Fort Hays Studies Special Issue 3, Fort Hays State University, Hays, Kansas, pp. 131-136. Tanimoto, M. 2008. New material of Kourisodon sp. from Japan. Proceedings of the Second Mosasaur Meeting, Fort Hays Studies Special Issue 3, Fort Hays State University, Hays, Kansas, pp. 156-158. Young, B.A., Boetig, M., Fahey, A., and Lawrence, A. 2008. The diversity of aquatic locomotion in extant varanoid lizards. Proceedings of the Second Mosasaur Meeting, Fort Hays Studies Special Issue 3, Fort Hays State University, Hays, Kansas, pp. 159-167. Wahl, W.R. 2008. Bite marks on an ammonite; Re-evaluation of the limpet home marks versus mosasaur predation and preservation of an aborted attack? Proceedings of the Second Mosasaur Meeting, Fort Hays Studies Special Issue 3, Fort Hays State University, Hays, Kansas, pp. 168-172.